Facebook’s WhatsApp added real-time location tracking as a feature last October, and Samsung might be gunning to challenge that popular service or to compete with one of Tencent’s messaging apps. But just because Samsung has filed a trademark for the name Uhssup doesn’t mean that’s what it will be called in the end, and it doesn’t mean for sure that a new social app is even on the way. We’ve reached out to Samsung for more information and will update this post if we receive a reply. It’s easy to forget about messaging services when we talk about social media. In the US, we tend to focus on the sort of micro-blogging that Facebook and Twitter offer, but going by worldwide active users, three of the top five social networks are messaging apps. And that’s kind of great. Actually sending a message to a specific someone is legitimate social interaction. What’s not so great is the name Uhssup. Here’s the thing, this name doesn’t have to go to waste. Samsung can go ahead and make a WhatsApp clone, a location-focused social app, or whatever—and keep the name simple. But the world is hungry for a return to the simplicity that was offered by the greatest social network of all time: Yo. 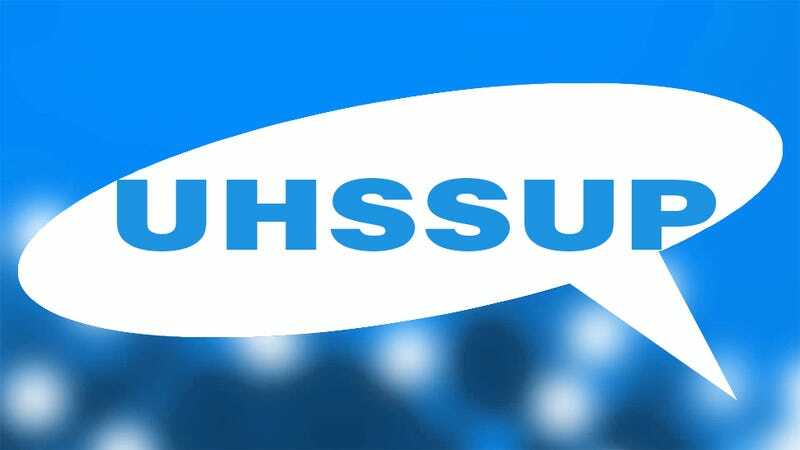 Samsung should make a totally separate app, call it Uhssup, and make it so all you can do is send your friends the message, “Uhssup.” Yo was good, and everything else is bad. As bad a name as Uhssup is, I’ll take it.